Is That Bruce Lee as Kato in the 'Once Upon a Time in Hollywood' Teaser? The press materials that accompanied the new trailer for Quentin Tarantino’s “Once Upon a Time in Hollywood” say the film “visits 1969 Los Angeles, where everything is changing.” But a delightful scene in the trailer, featuring Mike Moh as Bruce Lee, seems to take place in 1967. Or 1966. Let me explain. In the late 1960s, Lee kicked around Hollywood serving as a martial-arts “sifu,” or master, to actors like Steve McQueen. He also choreographed fight scenes and played sidekick roles, even though he could out-kick, out-punch, and usually out-joke the leading man. His first big sidekick role was as Kato on “The Green Hornet,” which aired on ABC from 1966 to 1967. 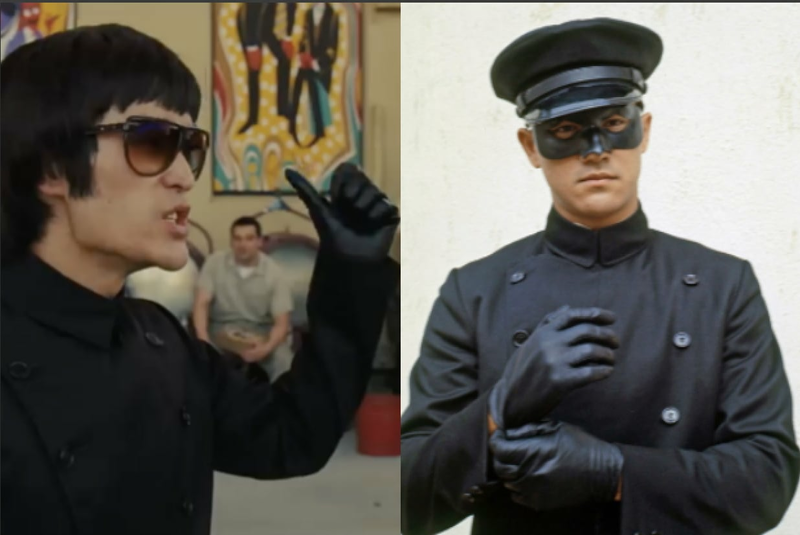 On the show, Lee’s Kato wore a traditional chauffeur’s uniform of black gloves and a collared, double-breasted black tunic. He also wore a hat and a cool mask. See what I’m getting at? It seems that the scene takes place during some downtime on the set of “Green Hornet,” which folded two years before 1969, when the press materials for “Once Upon a Time in Hollywood” say the film takes place. There are of course a lot of possibilities here. Maybe Lee still had his Kato costume lying around in 1969, and liked wearing it. But that seems unlikely, since Matthew Polly’s “Bruce Lee: A Life” tells us that Lee was never pleased with second-banana roles. Another possibility: Tarantino just needed Lee to wear something, and decided on a costume that looked a lot like the Kato costume. Because why not. But the third possibility, and my favorite, is that “Once Upon a Time” will use flashbacks to enrich the story and give us glimpses of the era just before 1969, when everything started changing, to show what things were like before. It was an era when a non-famous stuntman felt fine laughing off Bruce Lee’s admonition that his hands were lethal weapons, because Bruce Lee was not yet BRUCE LEE. Columbia Pictures’ news releases says the film “features a large ensemble cast and multiple storylines in a tribute to the final moments of Hollywood’s golden age,” and I wouldn’t complain if Lee played a prominent part in one or more of those storylines. As we explain in this post, Lee played a small but bizarre role in the story of the Manson slayings: At one point, Roman Polanski, one of many celebrities who trained with Lee, believed his sifu might have murdered his wife, Sharon Tate, and the other guests at their home on the horrible night of Aug. 9, 1969. Polanski’s grief-blind theory was obviously incorrect. But we wouldn’t totally object if it inspired some ideas for Tarantino’s tenth movie. How’s this for a logline?” “A Hollywood director seeks vengeance against his wife’s killer… his own kung-fu master!” Maybe? Just spitballing here.